Last update noted that some new intermediate buy signals had triggered and expected that the rally still had/has further to run. 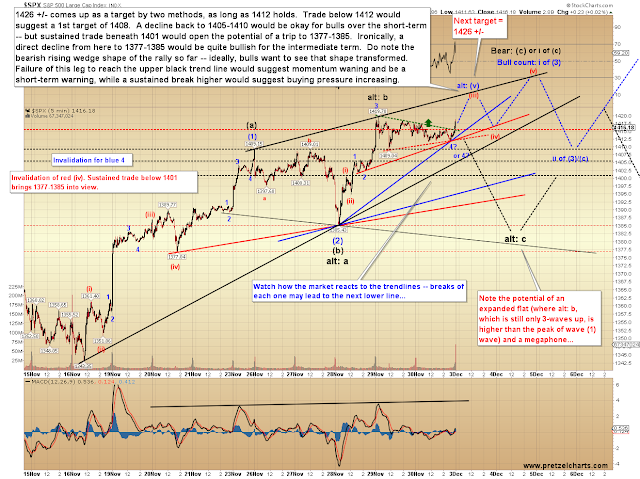 Friday appeared to be a triangle consolidation, so there's been no material change, and I still expect higher prices -- however, I have spent some ongoing time deciphering long-term charts (somewhere in the neighborhood of 400,000,000 hours during November), and believe I may have finally unlocked the intermediate wave structure. When the correction first began in September, I was initially viewing it as a fourth wave decline -- largely because the structure appeared to need a fourth wave, and most of my indicators suggested that 1474 was unlikely to mark a major top. But then the decline continued past the fourth wave invalidation level, and that raised questions for the bulls -- however, all throughout the decline to 1343, I continued to feel that the decline was most likely a corrective structure (meaning new highs are/were still out there for this market). 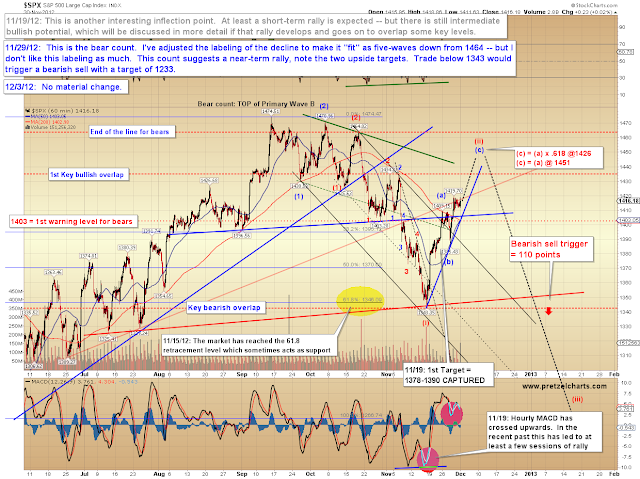 Without further ado, here is the S&P 500 (SPX) chart which I believe unlocks the intermediate structure. If you're new to Elliott Wave Theory, the most basic concept is that the market moves in five waves when it's headed in the direction of the next larger trend, and in three waves (or combinations thereof) when it's heading against the next larger trend. 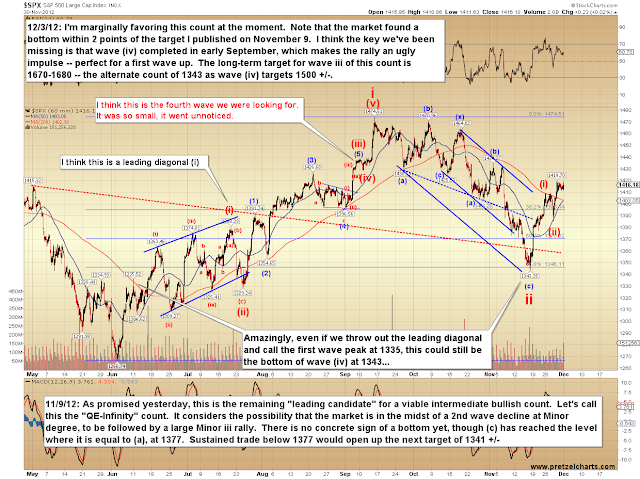 I believe the rally counts best as five waves, and the decline from September counts best as two three-wave structures. This would mean the long-term trend is still "up." I've been giving a slight long-term edge to the bulls for a while, and while the market hasn't yet reached the point where we can say the bears are out of the running, unless the market starts declining in a true five-wave impulse, I think we have to give serious consideration to the wave count shown below. Note that the decline found support almost exactly at the 61.8% retrace, which is perfect for a second wave decline. 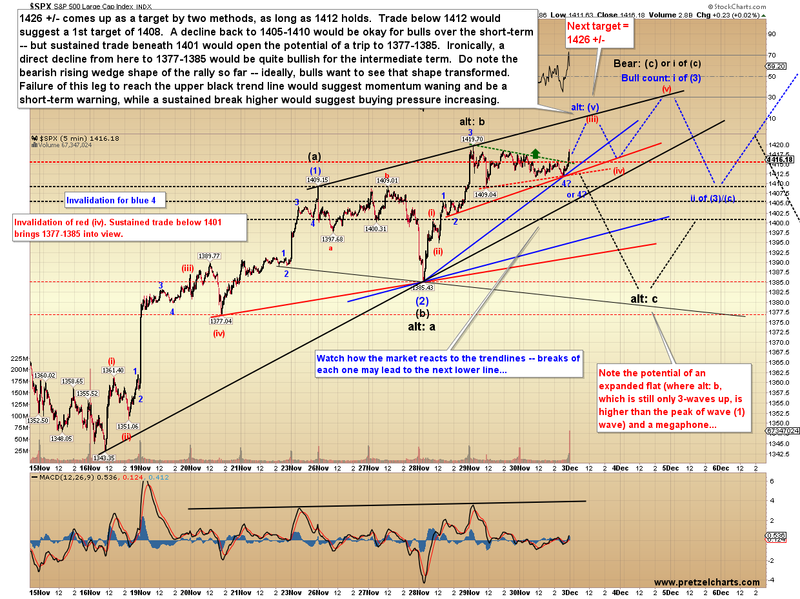 This count suggests the market is on the cusp of a massive rally -- a third wave up at Minor degree. About mid-way through a third wave, the masses recognize what's happening and jump in -- and momentum continues in a relentless fashion. I'm still not ready to say this count is "the one" -- but my gut likes it a lot. 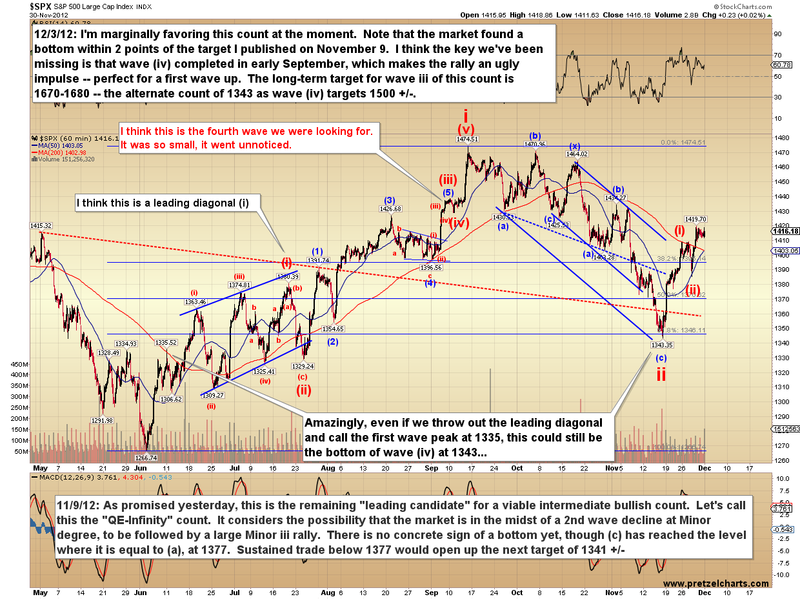 Now it's up to the bulls to prove it with some key level breaks (noted later). The bear count is still alive and well, and as I mentioned, there's no way to definitively rule it out yet. I just don't like it as much, which is more a function of my own trading experience (and many years of practicing Elliott Wave) than anything. 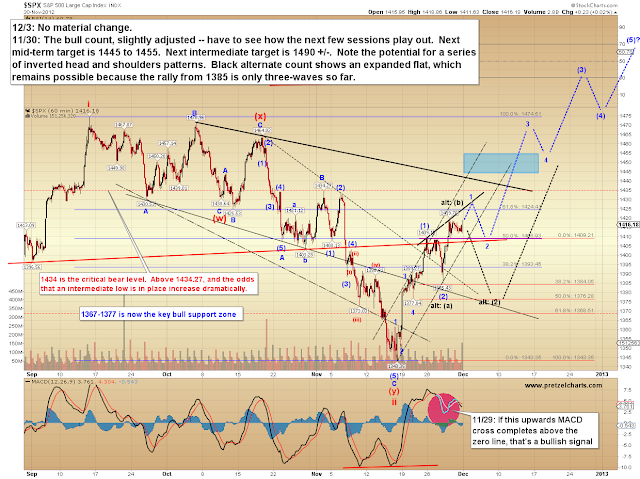 But I'm still only handicapping it slightly at this point (let's call it 55% in favor of the bull count, 45% for the bears), and there is still the potential for a wave (ii) peak as long as the market holds beneath 1464. 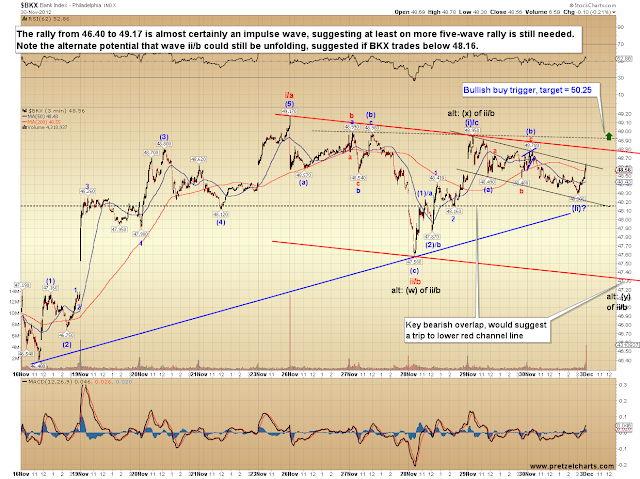 Finally, just a quick bonus chart of the Philadelphia Bank Index (BKX), along with a couple trade trigger levels. 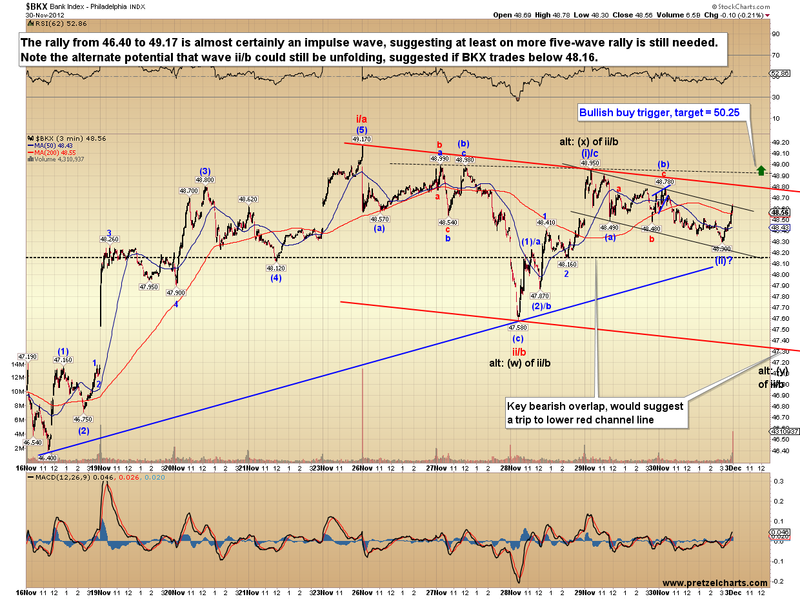 The BXK may be hinting at a bigger rally over the short-term than the structure is currently projecting on SPX. In conclusion, I am continuing to give a slight edge to bulls over the long-term, but the bears are still technically in the game and trade beneath 1343 at any point in the foreseeable future would be very bearish and cause me to capitulate any bull hopes. I continue to expect higher prices for the time being, and while there are some signs that a correction may be due soon, there's yet nothing to indicate a major top is near. While there will surely be corrections along the way, I tend to think that bulls will probably get their Santa rally -- but I'll continue noting the key downside levels which could change that expectation as it becomes appropriate. Trade safe. economy is stagnant or contracting. clearly shows that no bull market trend based on recovery is justified. sustainable. Investment can only come from profits and wages; drawing down savings out of fear of devaluation is not sustainable.